GibsonSingleton Virginia Injury Attorneys has launched a “Texts=Wrecks” campaign to reduce the number of people injured or killed by distracted drivers in this area. As background, 80 percent of crashes in Virginia are now tied to distracted driving, according to AAA. An average of 11 teenagers die each day as a result, and texting while driving causes nearly 330,000 injuries each year in the United States, according to the National Safety Council. 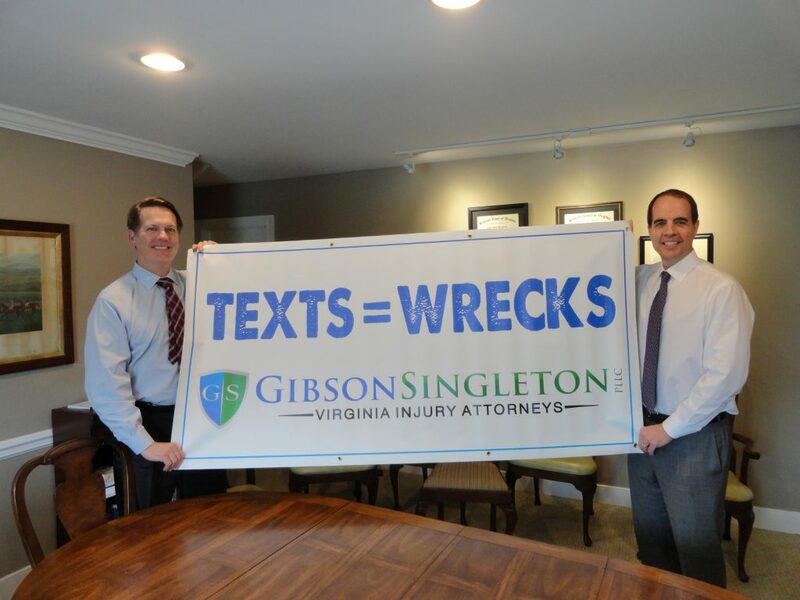 Local attorneys John Singleton and Ken Gibson show their “Texts=Wrecks” banner and prepare for the presentations they will give to students at Mathews and Gloucester High Schools in March. They will present to students in Middlesex in April. The lawyers have launched a campaign to reduce the number of people injured or killed by distracted and reckless drivers in this area. GibsonSingleton is working on several fronts to encourage people to stop driving while distracted. The firm is using its billboard on Route 17 to remind drivers that “Texts=Wrecks” throughout the spring. The firm plans to place a wrecked car, along with a banner, in front of its office to alert people to drive more safely. Partners Ken Gibson and John Singleton are giving several presentations to local high school students promoting the “Texts=Wrecks” message. On March 26, the attorneys will present to 60 sophomores at Mathews High School, and on March 28, they will present to approximately 200 sophomores at Gloucester High. They will use a distracted driving presentation that’s part of a nationwide campaign by End Distracted Driving (EndDD.org) and the American Association for Justice. The program was developed by Joel Feldman, an attorney in Philadelphia, after his 21-year-old daughter was killed by a distracted driver. The GibsonSingleton attorneys are staging a mock “driving under the influence” (DUI) sentencing trial for Middlesex High School seniors on April 20. The trial will demonstrate what can happen when teens drink alcohol and drive. The attorneys are working with Middlesex County School Resource Officer Chris Gatling to stage this event. 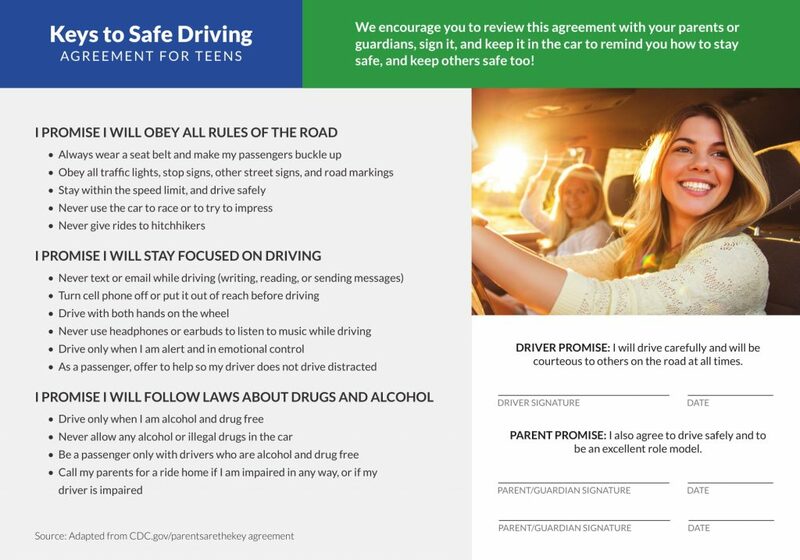 The firm has created an agreement card for teens, “Keys to Safe Driving,” based on guidelines from the CDC. Parents are encouraged to use it make a contract with their teen drivers to obey the rules of the road, stay focused on driving, and follow laws about using drugs and alcohol. The card and other useful information are available at the bottom of this blog…keep reading! Finally, the firm is offering a $1,000 college scholarship to a high school or college student who writes the winning essay about how young people can drive more safely. The deadline to apply is May 30, and the winner will be announced on July 3. Make your phone impossible to reach. Put your phone in the backseat, or somewhere completely out of reach. That way, you can’t reach it while driving even if you try. Silence your phone while you’re driving. This helps avoid the temptation if you get incoming messages or calls with alerts. Or you can put your phone on airplane mode so nothing can come through until you’ve stopped and changed the setting. Psychologically, either one can help you feel “offline” when driving. Stop and turn off your car before using your phone every time. Condition yourself to pull over safely or park and turn your car off every time, before allowing yourself to pick up your phone. Download a pledge card for your teen driver! As promised, here’s our Keys to Safe Driving agreement for teens that you can download and share. All you have to do is print it out, discuss what’s on it seriously with your teen drivers, have them sign the agreement, and keep a copy in their cars to remind them! As lawyers, we understand the value of putting things down on paper, and we’re sure this will help your teen make safe driving choices. 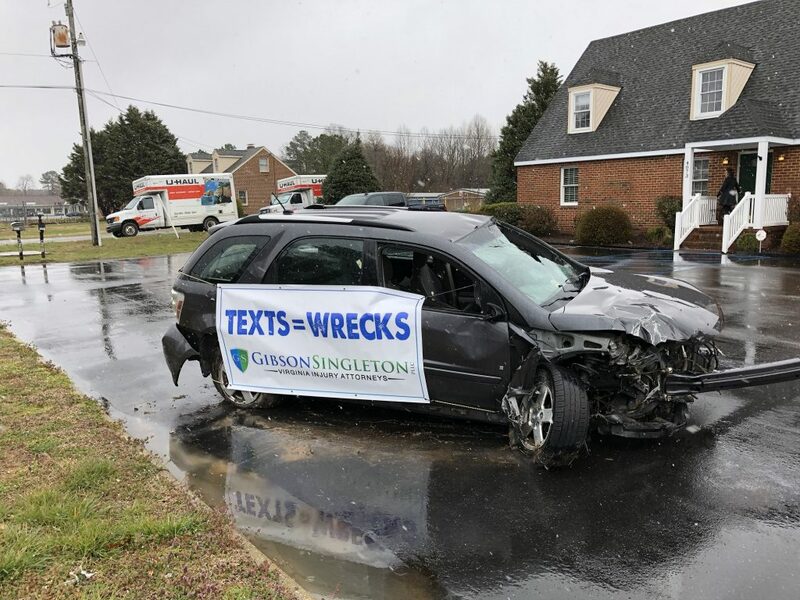 More about the “Texts=Wrecks” campaign, other tips, and scholarship information are available at GibsonSingleton.com, or by contacting GibsonSingleton’s community outreach director, Beth Gibson, [email protected] or (804) 413-6777. The attorneys are available to speak to other local groups about avoiding distracted driving as well.